Are you a slow-to-burn person who simmers until you explode? Or does your anger flash hot and bright, only to be extinguished moments later? Does revenge calm the rage? The twenty-one authors of Wrath’s volume in the young adult series Seven Deadly Sins have their own ideas. It’s my pleasure to introduce you seven more authors and their stories! If any of the blurbs catch your eye, consider posting a review on Amazon or Goodreads. The anthology will be released on August 11, 2017! Kendra starts working at Hope Springs, where she will care for elderly patients with dementia. She is full of young ambition, and wants to make a difference. But a low budget and understaffing mean the patients can’t get the proper care they need. The workers who do show up seem to be more concerned about the looming full moon than anything else. Kendra doesn’t believe in the old wives’ tale, but could there be some truth to it? Matthew Dewar’s passion for reading and writing developed at a young age. Fascinated by all genres, enthralled by the endless creativity of imagination, and captivated by foreign worlds and intriguing characters, Matthew makes time in his busy schedule to write every day. If he’s not reading or writing, you might find Matthew working as a physiotherapist, teaching group fitness classes, entertaining his dog, or dreaming of travelling to an exotic destination. In May 2017, Matthew published Nightmare Stories, a collection of young adult horror fiction where twelve young teens discover that happily-ever-afters only exist in fairy tales. His short stories have appeared in From the Stories of Old, and The Seven Deadly Sins Anthology: Gluttony. Since Pop’s death, Billy has complied with all of Ma’s requests. One night he meets Sara, a young tattoo artist, who weaves her magic through words she writes on Billy’s skin. Ma hates the tattoos, while Billy feels newfound energy surging through his body. When Ma crosses the line with Sara, Billy is forced to take a stand or forever be left to do what he is told. J. Grabarek is a beautiful Californian enchantress who weaves stories from inside a secret chamber in the darkest parts of her castle. Her dragon Blue snores by her side as she writes of the sea, mermaids, and delicious tacos. Blue stop it. She meant sailors, ships, and hot dogs. Blue wants the readers to know the truth: he’s hungry, he is a Pug dog, and the stories are written while she is sitting in a maroon bean bag in her closet. She and Blue intend to read her story and other excellent stories in this Wrath volume of the Seven Deadly Sins Anthology while sharing a few slices of pizza. College student Danny is a computer genius, building an artificial intelligence robot that can do his classwork for him and earn him some extra dollars on the side. He even personifies the robot, naming her Maud’Dib. Danny scavenges as much memory and other parts as he can to add to her, including Wi-Fi access. Soon, Maudie takes control of her motherboard and starts making her own decisions: humans were starting to look not only unnecessary, but downright dangerous. Zach isn’t worried about the strange recurrent dreams he’s been having, until they begin to creep into his daily life. Things get weirder when a glowing lightning bolt appears on his arm. With the help of the new girl at school, Zach starts to realize what is happening to him. Can he accept his destiny in time to save himself and the school from a vengeful god? Tonia Markou is a Greek-German writer and Creative Writing graduate, currently working on her first YA novel. Basically being a big kid, she enjoys writing and reading fiction for young adults. Her short stories have appeared in Flash, and The Seven Deadly Sins, A YA Anthology: Envy and Gluttony. She’s the proud owner of a vast Converse Chucks collection, and is obsessed with stationery, mugs and pajamas. Sixteen-year-old Arianna lives in Ireland and is excited about the school trip to Paris, especially as her boyfriend, Tony, will be going. Her mother is easy-going, but her father needs to agree to it, and he runs on a short fuse. When her father loses his temper, Arianna becomes angry with him, and her acts of rebellion escalate. Geraldine McCarthy lives by the sea in West Cork in the Republic of Ireland. In a former life she was involved in tutoring, lecturing, translation and research. She has been writing short stories and flash fiction for almost two years now. Her work has been published in The Fable Online, The Incubator Journal, Seven Deadly Sins: a YA Anthology (Gluttony), Scarlet Leaf Review and Brilliant Flash Fiction. She was delighted to bring back the character, Arianna – one year older and bolder – for the Wrath edition of SDS. The year is 3082; the human species is well nigh finished on what is now known as the planet-state of Europa. An Archeologist has returned from another intrepid journey amongst the remnants of what was once called North Eastern America. The cocky chap relieves himself of the late-world’s many stressors the same way his ancestors did: A journal entry in the twilight of his otherwise dark and foreboding study. C.P. Mulé has had many childhood nicknames—all of his own invention. The boy of yesteryear took inspiration from films, athletics, or even from on-the-nose dad jokes. This assortment of many masks never gave him any sort of satisfaction. In a journey to better himself and those he loved dearly the boy became a young man; he took off his mask and put on his glasses. Now his every day is filled to the brim with joys and the world’s great mysteries like this very publication. He is so very humbled to appear in the Seven Deadly Sins Anthology with his first-ever published work, Wrath: An Archaeological Case-Study. Three different people, three different wrongs, and one intention in mind: revenge. Their own brand of justice burning in their hearts, Wrath guides the hands of three young adults as the ancient entity helps lead them down the path of revenge. Yvette O’Kay is a writing goddess that has been creating stories ever since she was a little girl. She is from New York and has been featured in three previous volumes of Seven Deadly Sins: Sloth, Envy, and Gluttony. We all have that “kind” self who smiles at strangers, doesn’t hurt other people’s feelings, and keeps calm when faced with confrontation. And then there’s the other. The one lurking in the shadows, ready to appear when patience runs thin and blood starts to boil. The one who revels in the aftertaste of destruction. The one we try to hide. What happens when we invite the darkness to come out and play? Twenty-one authors. Twenty-one stories. One theme: Wrath. 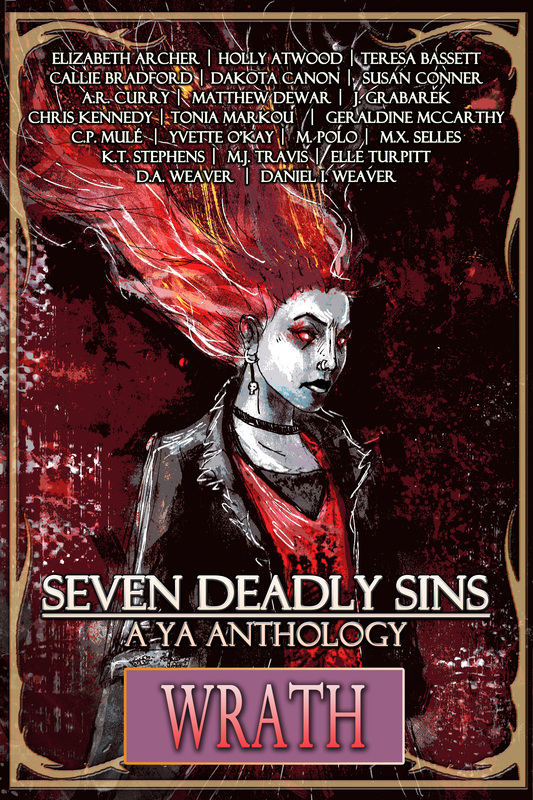 Welcome to the fifth volume of Seven Deadly Sins, A YA Anthology! This is Day One of introductions to the authors and their stories. If any of the blurbs interest you, consider posting a review on Amazon! The release date for this volume is August 11, 2017. Odd, awkward and irritating, it’s Julia’s first time at an American school after a life as a missionary kid in Africa. Why are some people so infuriating? Why is banana cream pie something Elizabeth will never forget? Elizabeth Archer lives in Texas and dreams of other places and other worlds. She writes poetry, fiction and too many novels. Her current passion is fairy tales. She has been published in a variety of places, including three volumes of Seven Deadly Sins, A YA Anthology: Pride, Sloth and Gluttony. Ivy’s brother’s corpse is rotting somewhere in the Somme mud, but he hasn’t left her yet. With his thin, sad ghost trailing at her heels, she sets out to exact justice against the man who sent him to his death. But will her revenge cost her all of her brother that she has left? Holly Atwood is paid to work in a library–living the dream–and spends her free time working on a fantasy trilogy, out of sheer masochism. She is honoured to make her first appearance in print with Getting Even in the Seven Deadly Sins Anthology. She likes cats, baking and triathlon. She hates fish. Liz and her friends invite new girl Paula from Portugal to join them for lunch at school. Paula is a quiet sort, and they find out her father just got a job at the local factory. Liz is surprised when her best friend, Carole, verbally attacks Paula, shocking them all. Until the girls find out that Carole’s father was sacked from the same factory. Liz is disappointed in her friend’s actions, but it’s Paula who has to make things right. Teresa Bassett is a writer from Cornwall, UK. She has written stories and articles for a variety of publications, and is proud to be included in each of the previous volumes of Seven Deadly Sins: A YA Anthology. 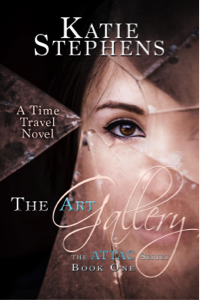 Her debut novel “The Time Crystals” is due to be published in 2017 by Books to Treasure. A graduate of the University of Bath, she has worked as a foreign tour guide, translator and teacher. She and her husband live with their eccentric greyhound and even more eccentric cockatiel in a caravan on a former tin mine, where they are busy building their own home. Ghost hunting is the worst after-school job—high stress, no time for friends, and no actual money. Wren has been struggling with her own demons while helping lost souls move on to the other side. Now she’s facing the biggest challenge of her life, and she’s not sure she can handle it alone. But maybe she doesn’t have to. Callie Bradford spent much of her youth obsessively searching spider-filled basements for hidden doors and secret passageways. Despite her lack of success, she still hasn’t given up looking. Callie lives in Cleveland, Ohio, with her husband and a one-eyed dog. Her work also appeared in Seven Deadly Sins: Gluttony. Lydia has lost much in her short life. She’s always hated her foster mother’s frequent trips to Walmart, where she’s forced to babysit her foster brother. She’s not even allowed to linger in the parking lot to watch the crazy homeless woman who’s captured her attention. But one day, when a silver charm in the jewelry section catches Lydia’s eye, she becomes convinced things will change–that the charm will work wonders and mend her broken heart. Dakota Canon is a left-brained professional by day, masquerading as a right-brained artiste by night. She has been writing stories since the second grade when she spent a whole year penning her future autobiography. After far, far too many years in school, one preteen, a viscous cat, and an unfulfilled desire to discover a theory she could name after herself, Dakota started assembling her writings into something that might someday resemble a novel. She has been lost ever since. Hell hath no fury like a teenager scorned. It doesn’t matter how much Stretch tries to distract Corinna from her ex-boyfriend Zach (the jerk), Corinna is bent on revenge. When they enter a carnival tent and hear the tale of Katanga and Nissool, Corinna can’t get her hands on the magical elixirs fast enough. Who would suspect the combo would release a wrath so primeval, new legends are about to be spun? Susan Conner is a desert dweller of Phoenix, Arizona, where she routinely escapes the heat and her adult responsibilities by creating quirky stories filled with magical, fantasy, and sci-fi elements. Cursed with a vivid imagination bestowed upon her by a fragrant, banjo-playing Sherpa with a charming drawl and eyes the color of a glacier lake, she paints, draws, and writes novels for adults and young adults alike. She’s ecstatic to once again appear in the Seven Deadly Sins Anthology, which featured her story, The Makara, in its Gluttony edition. The duel Cyclops Kings rule together, greedily overfilling their treasure troves until The Day of Dominance. On this day, each king selects a handful of slaves to battle in the coliseum on their behalf; the winning side determines which king will get the biggest cut from that year’s spoils. However, this year’s stakes rise for a young warrior who finds himself pitted against an opponent he can’t bear harm. Problem is, if he refuses or loses, he dies. And his younger sister will share his fate. A. R. Curry is an unremarkable individual who has decided to write about remarkable things in order to live vicariously through them. This way, he can at least take credit for impressive achievements, imagined or not. He’s a graduate of the University of Missouri – St. Louis, and the father of three genuinely remarkable children who, thankfully, are on much better trajectories than him.